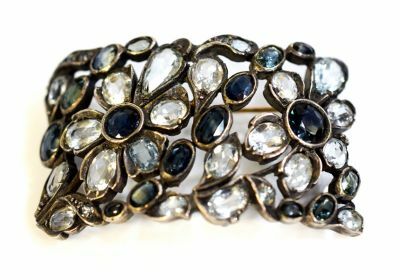 A wonderful antique 10kt yellow and white gold stylized floral brooch featuring 2 round faceted cut deep blue sapphires, est. 3.47ct; 14 oval faceted cut medium blue sapphires, est. 8.52ct; 20 oval faceted cut light-to-medium blue aquamarines, est. 10.00ct; 4 round faceted cut light blue aquamarines, est. 0.24ct; 2 pear faceted cut light-to-medium blue aquamarines, est. 4.85ct. The brooch has a 14kt yellow gold pin.